The popularity of the industrial farmhouse look has opened up a whole new resource for where to buy home decor: the hardware store! Since metal is one of the key ingredients to achieving this look, the hardware aisle has become prime hunting ground for do-it-yourself home decorators. Pipe fittings, chicken wire, fencing materials, door latches, and metal conduit are just a few of the possible items you can use to make your own industrial-style home accessories. Just take a look at these creative projects inspired by inexpensive supplies from the hardware aisle. Faucet handles make perfect perches for coats, purses or aprons. Use vintage handles if you want patina, or spray some in a variety of bright colors for a more playful look that's perfect for a child's room. Make an industrial-style paper towel holder using galvanized pipe and pipe fittings for the perfect accent to your farmhouse kitchen. Would you ever have imagined this use for old doorknobs? Re-purpose vintage knobs into a pair of charming metal bud vases. Open shelving is one of the hottest trends in kitchen design, but they look great in any room. Rest reclaimed wood or pre-cut wooden shelves on supports made from galvanized pipe for that rustic look you love. This clever project utilizes two trendy materials: denim and copper. A sturdy rack made of a pair of old jeans and copper pipes and fittings from the hardware store results in a sling that supports your magazine habit. Almost any kind of wide-mouthed jar (like spaghetti jars, for instance) can be turned into a hanging vase with the help of stainless steel band clamps. Reclaimed fence pickets and an old door give this trio of vases even more of a farmhouse feel. Turn a few old bottles into an industrial accent by wrapping them with bare copper wire you can buy by the roll at the hardware store. Use your thrifty new vase for single flower stems, large hosta leaves, fern fronds or boxwood clippings. This clever project re-imagines rusty old hardware as trendy typographic art. Flea markets often feature vendors selling this kind of salvage by the crate-full, or you can add patina to new hardware using spray paint. The warm tone of copper is the ideal complement to autumnal decor such as fall leaves, acorns, and even feathers. Use copper pipe as a unique wreath form onto which you can attach seasonal flowers and other natural elements. Light fixtures offer a great opportunity to add industrial style to your space. Here's a bright idea: DIY a pendant using a spool and some conduit for an accent that's both a source of light and inspiration. Here are some more DIY light fixtures that utilize unexpected objects. Metal pipe straps and hose clamps hold summertime essentials on this pegboard organizer made to streamline a busy family foyer. Now sunglasses, sunscreen, goggles, bug spray, and even money for the ice cream truck can be organized for grab-and-go convenience. Trays have endless uses around the house. 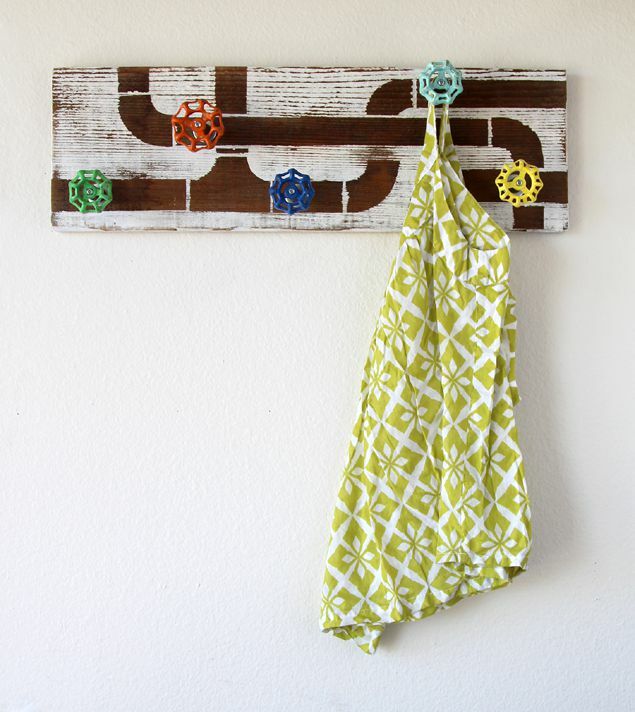 Make your own by attaching inexpensive screen door handles to a wooden cutting board, then display it proudly in a farmhouse-style kitchen or on a bar cart or coffee table. Speaking of trays, here's a tray table that got an upgrade in style thanks to some simple square metal plates glued to the corners, giving it the look of vintage campaign furniture. Steal this idea to give industrial style to other kinds of accent furniture, picture frames, trays or mirrors.